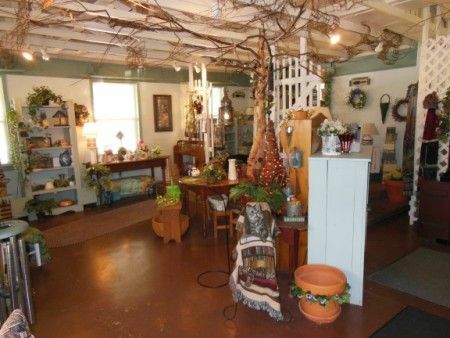 COMMERCIAL BUILDING * 1.398 ACRES +/- plus ANTIQUES * FLORAL COMMERCIAL COOLERS * PRIMITIVE DÉCOR * Being a Commercial Building with Great Location, Street Appeal, Asphalt Parking & a New Business Generating Established Area! You have seen this business time & time again, now the opportunity has come to relocate, build or GROW your business here! As agents for Ms. June Romeo, Owner of Forget Me Knot Flowers, being “It is time to retire” we will sell the following described Real Estate & Personal Property on the premises. Being a Nice Commercial Building, Green House, Storage Building and Gazebo with large asphalt parking lot and rear turn-around situated on 1.398 acres +/-. The Commercial building with Front Sales/Consultation Area with Bathroom has a partial basement with exterior entry door and block foundation, apx. 3 year old shingle roof on all buildings, gutters & downspouts with a covered front & side wrap around porch. Equipped with (2) 200 AMP breaker boxes, (2) gas furnaces & (2) central A/C units, City water and septic tank. The attached addition built in 1991 offers two rooms on concrete slab with concrete floor: 1st room is currently utilized as a Retail Sales room offering utility sink, exterior access double side doors and side entry door. 2nd room currently utilized as a Preparation/Employees Area with rear entry door. Green House with electric, water and gas DAYTON Furnace with front covered brick patio utilized for producing Flower product for the business. This property has a tremendous amount of potential for many businesses and investment aspects! Open your imagination and your eyes to see what best fits your ideas and inspirations! Too many antiques to list! 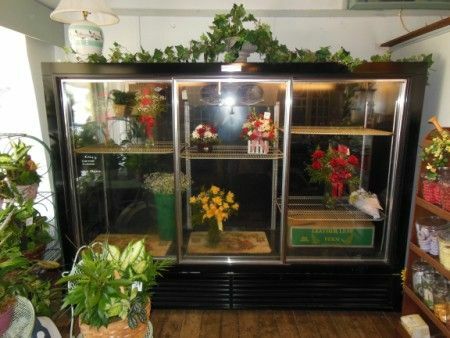 3 Sliding Door Floral Cooler Bush Refrigeration Equipment Model: FS103GDB; TRUE 2 Door Prep Station Cooler Model TUC-60; TRUE Standup Floral Cooler Model AE444OA GEM23; Display Counters; The Standard Computing Scale Co. Detroit Mich. Scale; NATIONAL Cash Register Serial #: 1132343/1064; NATIONAL CASH REGISTER no plate; Vintage Hand Well Pump; Longaberger Baskets; Silver Dinner Bell; Yard Man 6.5 HP 21” Cut Push Mower; Gas Cans; Yard Tools; Aluminum Step Ladder; Coal Bucket; Watering Cans; Tricycle; Vintage Baby Doll Stroller; Primitive Men’s Clothing Display Rack; Primitive School Desks; Yard Ornaments; Ranch Wagon Wheel King Wagon; Vintage Rocking Chair; Step Ladder; Extension Ladder; Utility Wagon; Bench’s; Wrought Iron Table with 4 chairs Ice Cream Shop Style; Antique Sales Counters; Hardware Display Sales Counter; Many Vintage/Primitive Furniture and Display pieces; Primitive Wooden Fireplace Mantle; Hardware Display with pull out wooden boxes; Christmas Décor; Candelabras; USA 8 Gal. Crock; Vintage Travel/Storage Trunks; Candles; Primitive Décor. Real Estate Terms: Minimum Bid $55,000. ; $8,000. Down at time of sale; Offered free & clear prior to closing on/before October 6, 2014; Net Annual Taxes $1,965.10 pro-rated to closing; Sold As-Is; No Buyer’s Contingencies Exist. Balance & Possession upon closing subject to the condition that, Owner/Seller agrees to provide the option of Owner/Seller financing for any amount of the purchase price in excess of $30,000., and the amount financed shall be evidenced by a promissory note bearing interest at 5% per annum for a period of 120 months, in consecutive monthly installments of principal and interest, and secured by a mortgage on the subject Real Estate purchased. Seller/Owner agrees there is no pre-payment penalty.See future auctions.